I had never attended a bris. The thought of cutting off a baby's foreskin made me queasy. That’s when it hit me: How in the world was I going to witness my own son going through it? I put that thought aside, figuring I'd deal with it when it happened. That brings us back to our midwife appointment. 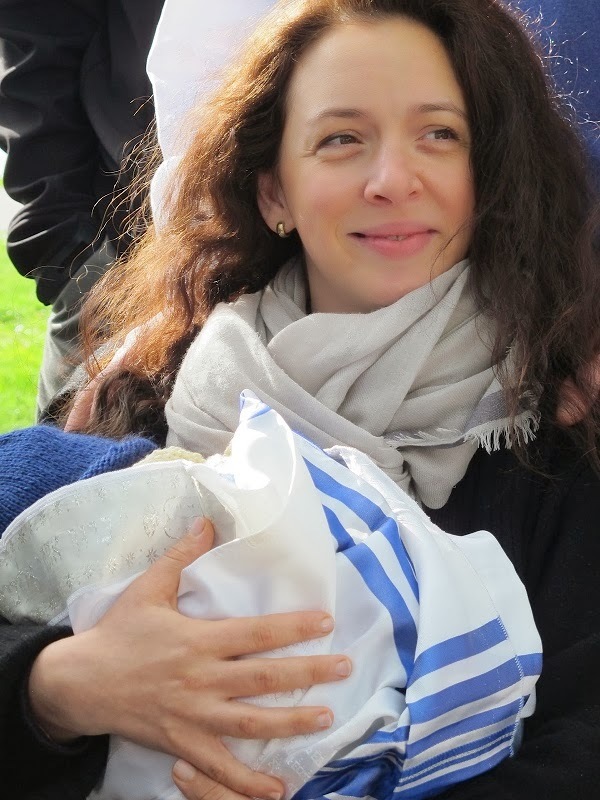 My answer to the midwife was, “We're Jewish so we need to have a bris. I have no idea how I'll be in the same room, the thought disgusts me however….” That’s when the midwife said something that changed everything. She said, "You know, there are alternatives. There are ways to honor your religion without cutting off your son's foreskin." REALLY!? The midwife also gave me a book by a rabbi about circumcision. I took it home and read it cover to cover. I came away resolved that there was no way I could do this to my child. This lead me on a search for a rabbi who would perform a bris without circumcision. 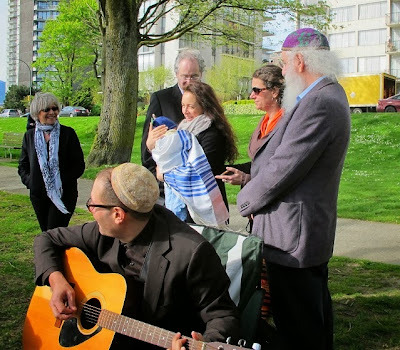 I spoke to a rabbi from a Reform synagogue and told him about my feelings of wanting to have a ceremony without circumcision. He had a glib response that didn’t take into consideration how serious this issue was for me. He said, "So you just want to have bagel, cream cheese and lox?" He then proceeded to tell me, at length, about how I'd come to regret the decision not to circumcise. 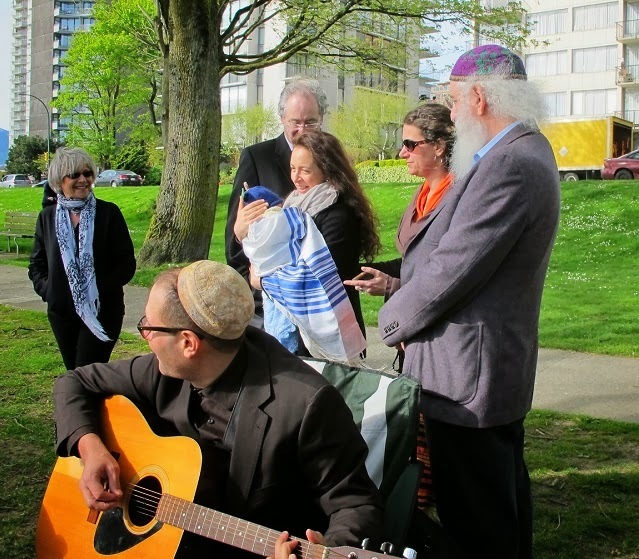 Just as I was feeling defeated, I found a website that lists over 100 rabbis who perform brit shalom, an alternative to brit milah. (Brit shalom contains the symbolic elements of the covenant ceremony, but without circumcision.) At the time, there was only one rabbi listed for all of British Columbia… but he just so happened to be in my city, Vancouver! I later discovered his name had been added about three weeks before I’d found it. I believe this was the universe rewarding us for following our hearts. I connected with Rabbi David Mivasair in such a deep, meaningful way. I grew up going to Jewish school, attending synagogue--and yet I had never met a rabbi whose words inspired me the way his did. If I wasn't convinced before that we had made the right decision, I was now. After meeting with the rabbi three or four times, it came time for the ceremony. On the eighth day of my son Kai's life, we had a ceremony across the street from our house, right by the Pacific ocean. We had our good friend playing guitar while we all sang in Hebrew. Rabbi Mivasair explained to everyone the meaning behind what we were doing in an eloquent and meaningful way. Instead of circumcising our son, Amari and I decided that each member of our immediate family would bless a part of Kai with olive oil. I blessed his bicep and explained it was so he would have the strength to stay true to his beliefs, to who he was. My wife blessed his heart, wishing him to be full of love for everything and everyone. Each member of our family had an opportunity. The service concluded with the whole group gathering behind us. Kai was in the front, Amari and I behind him touching his shoulders, and everyone behind us touching the person’s shoulders in front of them. We said a blessing, with the group energy passing and growing from hands to shoulders all the way to Kai. Kai is now five months old and Amari and I couldn't be happier with our decision. We encourage everyone to do their research and follow their hearts. You can never go wrong doing that. Shawn Stark grew up in a Jewish community in a suburb of Montreal, Canada, where he attended Jewish elementary school. He later moved to Vancouver. He met his wife, Amari, at a wedding in Montreal and she moved from London to Vancouver seven months later. They currently live in Vancouver, living on the beach and loving life. This is such an inspiration! The ceremony brought tears to my eyes. How special and unique. Your son is very lucky to have parents that stay true to their heart. Thank you for this beautiful story. It moves me deeply that you could make such a brave, compassionate decision, and know how right you are in every aspect of parenthood. What a wonderful story, this will certainly inspire others! That's the way to welcome human being in the world. A blessing is so much better than surgical amputation... It's pretty common in Israel to rush to the hospital after Bris that a doctor can burn the fresh cut with an electric knife, because the baby is bleeding uncontrollably. I will translate this article to Russian as a good example of alternative to Bris (for Russian-speaking Jews). I was circumcised and I refused to allow this to happen to my son. But in the minutes it took me to read your essay, I was a Jew. And through the channel of Judaism, I felt your love for your son as one with my love for my son. Brother, thank you for words that made water in my eyes. And I think your wife must be a beautiful woman. So amazing! Thank you for sharing!! Thank you for telling your story. In the first century when the Temple was destroyed, animal sacrifices ended. This door that closed opened the much greater door of the Mitzvah - personal sacrifices and good deeds for which the Jewish people are unsurpassed. At the same time, Jews became the People of the Book, a status that they could, and did, take all around the world and that made them a literate people whether rich or poor. I see the transition from ritual bodily circumcision to spiritual circumcision as another door that opens to far horizons of a more meaningful covenant, entrusting baby boys into our Creator's care without mutilating the sacred thing that is a baby's body, "knit together in the mother's womb." "Wonderfully made..."
This is such a beautiful story. Thank you for sharing it; I will share it with others. I'm uplifted to know that there are fathers like this in the world.